Last fall I took a class called Environmental Integration I: Perspectives (ENV 101) with Professor Ninian Stein where we discussed in depth the environmental impacts of fracking – which is short for hydraulic fracturing. For those who are not familiar with the term, it is a process whereby copious amounts of water, mixed with sand and other carcinogenic chemicals, is injected underground at high pressure in order to fracture the rock surrounding an oil or gas well. The process of fracking allows oil and gas to be released from the rock so that it can flow into the well and be extracted for use as an energy source to power our cars, homes and offices. However, the process of fracking threatens air and water quality, which in turn affects the health of human and wild communities in the areas adjacent to where fracking is taking place. Not only did we watch the fracking documentary Gasland in Professor Stein’s class and learn about the science behind the process of fracking, we also held a ‘mini congressional debate’. Each of us were assigned a different character in the debate on whether the U.S. should or should not move forward with fracking. In particular, I had to convey Sandra Steingraber’s (a critically acclaimed American Biologist and author from New York) views on the matter. Although this was a couple of semesters ago and I spent the spring studying abroad in Copenhagen, my interest in the issue of hydraulic fracturing has remained. To my delight, this summer I was able to secure an internship with an anti-fracking campaign at Food & Water Watch in Brooklyn, NY. Food & Water Watch is a consumer advocacy organization that works to ensure that the food and water we consume are safe, accessible, and sustainably produced. It is also a founding member of the New Yorkers Against Fracking coalition, which includes over 200 organizations from all over New York that help advocate against fracking. Together, all these organizations have been working to create more steam for the NY Crossroads Rally in Albany that was held on Monday, June 17th. 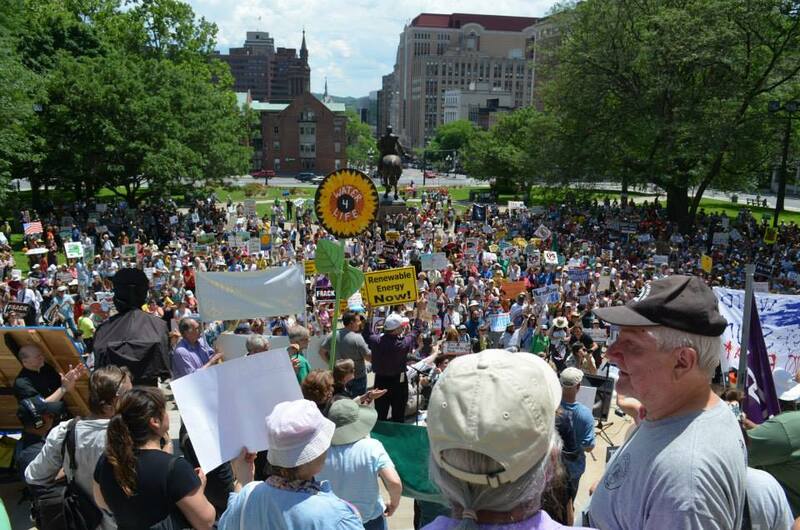 We were fortunate to make this the biggest anti-fracking rally in Albany’s history, with over 2500 peaceful protestors! A view of the Albany rally. Planning this rally and getting people to show up was a lot more difficult than I expected. I had never phone banked before and calling person after person on a roster while trying to remain friendly and upbeat was tiring and usually approached monotony by the end of each day. With the other interns, we worked day after day for about 3 weeks, both calling and emailing citizens as well as occasionally petitioning outside on the street to get the word out about this rally. It was not easy to get people to agree to come all the way to Albany from New York City on a Monday, and at times it was disheartening to hear a steady stream of “no’s”. But I think what kept us going was sporadically receiving a kind word from even just one person who thanked us for the work we were doing. To me, that was what made all the effort worth it! When Monday, June 17th rolled around it was definitely chaotic. It was very difficult in terms of organizing people onto buses – another thing I had never done before! When I got on the bus to ride from Manhattan to Albany, I was sort of disappointed that the demographic of people attending was not more diverse in terms of social standing, gender and age. I was wondering to myself – where are all of the young activists like me?! However, when we got to East Capitol Park in Albany, I noticed a wider demographic. There were people from all walks of life; farmers, mothers, academics, college students, children, and both Occupy and Tea Party folks. This was very inspiring to see, and gave me hope that the push to ban fracking in New York will be recognized by Governor Cuomo as an issue that doesn’t just resonate with the small niche group of people that are sometimes referred to as ‘granola hippies’. Rather, this is an important issue that matters to a wide variety of people across our communities. People came together in Albany to fight for something that affects everyone regardless of their circumstances: the protection of our drinking water and food systems. Overall, the rally was tons of fun – there were a lot of cool songs, chants, speeches and costumes, and there were lots of interesting people to see and interact with! There were quite a few speeches that were really interesting to hear as well. The one person that I was really excited and pleasantly surprised to hear speak was Sandra Steingraber, the same person I had had to learn about and portray in Professor Stein’s class. Her liveliness and her commitment to the issue really energized the crowd and I think it made our rally pretty hard for Governor Cuomo to ignore. In fact, we found out during the rally that people inside the Capitol building, including Governor Cuomo, could hear us! Sandra Steingraber speaks to the crowd. Despite being ignored by some while petitioning, and getting flack from others because we “wouldn’t stop calling them,” having the facts from ENV 101 has enabled me to stay motivated to spread the word about the environmental and health costs of fracking. 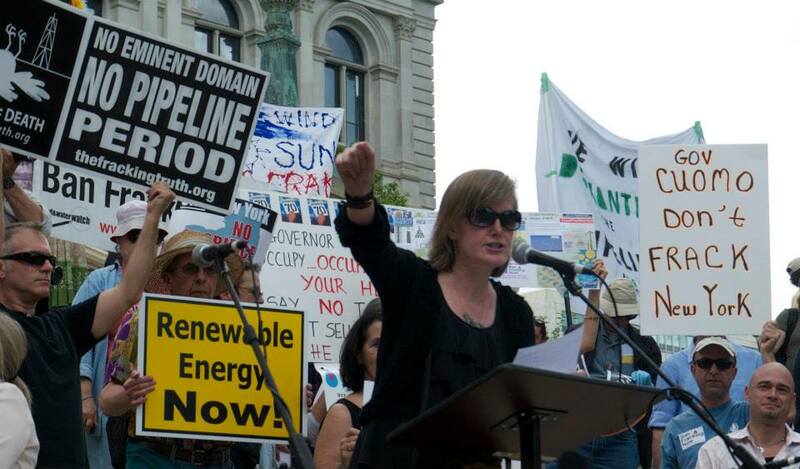 Helping organize the biggest rally in Albany to date has taught me that engaging in environmental action through what seems like menial tasks of calling and petitioning really can make all the difference and has fueled my fire to keep on advocating against fracking. Alina is a double major in Economics and Environmental Science and Policy. A former CEEDS intern, Alina grew up in Karachi, Pakistan and lives in Gardiner House while on campus.